The WHO and UNICEF Joint Monitoring Programme (JMP) report, Progress on Sanitation and Drinking-Water 2014 Update, highlighted how land-locked South-East African country Malawi remained seriously off-track from achieving the sanitation Millennium Development Goals target. This struck a chord with WaterWorks, a charitable organisation dedicated to assisting communities to gain access to hygienic sanitation facilities (as well as to safe drinking water). Because of these practices WaterWorks found that a quarter of all children under five would be suffering from diarrhoea at any one time. In Malawi, diarrhoea is responsible for the deaths of 6,000 children per year. The WaterWorks sanitation project is currently being implemented around a Health Centre in Chitedze, 20 kilometres or so outside of Malawi’s capital, Lilongwe. The project has a team of builders and artisans primed to construct toilets and water pumps in the area. With the support of Health Surveillance Assistants from the Chitedze health centre, the project team is identifying the villages that require support in the area, in addition to conducting essential hygiene training within the community. 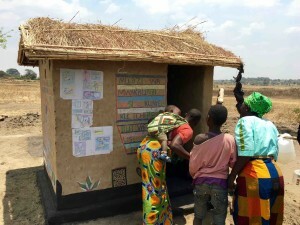 When a member of the UK Aid Direct Team visited Malawi last month she was informed by an elderly lady in Mwakhundi – a village in which a WaterWorks project was being implemented - that the village had now been given an ‘Open Defecation Free’ status, and that the toilet she used was now robust and sanitary. The previous toilet the lady had access to had been made of wood and it would frequently collapse in the rainy season. On completion of the project WaterWorks aims to have empowered 50 Malawian villages, with a population of over 10,000 people, to meet their water, sanitation and hygiene needs through improved hygiene awareness, practice and innovative, sustainable technology.